The Eastern Canada Amateur Hockey Association was formed December 11, 1905, to effect a consolidation of clubs who previously had been members of the Canadian Amateur Hockey League and the Federal Amateur Hockey League. The Arena Corporation of Montreal. presented the newly-formed Association the "Arena Cup" which was to be awarded annually to the league champion. Manufactured by Birks and handcrafted by early silversmiths using sterling silver, the 90-ounce trophy was adopted as the new league's centerpiece. 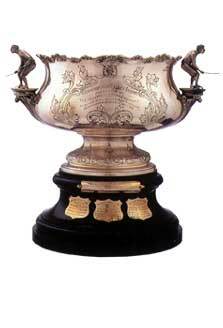 The league's only winners were the Montreal Wanderers who incidentally won the Stanley Cup the same years.